Tofu marinade is perfect for transforming a plate of bland-tasting food into tasty and satisfying vegetarian or vegan fare. Tofu is an ancient food that has been popular with vegans and non vegans alike through the centuries. Tofu originated in China and later spread to Japan and is used in both cuisines. Today, tofu is enjoyed the world over as a low fat, high protein food derived from soy beans. Tofu is a curd and similar to cheese in texture. Unlike cheese, however, tofu retains its shape while being cooked and is ideal for many interesting dishes. Tofu is naturally bland and this means that it is perfect for highly seasoned dishes as it absorbs the flavors. Another way of flavoring tofu is through marinades. Tofu marinade flavors and coats tofu, making it a useful ingredient to include in a variety of vegetarian and vegan dishes. Marinades traditionally have two purposes. Besides being used to flavor food, marinades are used as a tenderizer. 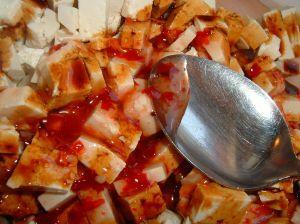 As tofu is very tender and soft, tofu marinade is not used to tenderize raw tofu. Instead, it is used solely as a flavor enhancer. Marinades are made from mixes of herbs, spices and other flavors with liquids such as water, wine or vinegars. Tofu is left in the marinade for several hours during which it absorbs flavors and become tasty. Some marinades encourage water to be leached from tofu. This makes for a more firm tofu that is ideal for dishes such as stir fries. Any marinade can be adapted for use with tofu. When cooking for a vegan or vegetarian, however, it is important to ensure that the ingredients used in the marinade are suitable. This means ingredients such as fish sauce, meat extracts or stocks would not be suitable. Honey is often used in marinades and this is not suitable for people who lead a vegan lifestyle. Tofu is extremely versatile and can be cooked in a variety of ways. This means that marinaded tofu can be stir fried, baked, roasted or braised. Marinaded tofu can also be slowly stewed with other ingredients. Marinaded tofu is a good addition to salads and vegetables. It can provide a flavorsome protein food for vegans and is much more appealing than plain bland tofu. Simple and healthy snacks can be created by dry frying seasoned tofu to make crisp and tasty tofu chips. These also make a useful addition to a lunch box for both adults and children. One of the most simple tofu marinades is a mix of garlic, ginger and soy sauce. The flavors combine with the tofu and make it perfect for using in stir fry dishes and recipes with an Oriental theme. Other simple marinades can be adapted from the seasonings used in a favorite dish or recipe. An Italian themed marinade, for instance, can be created using garlic, red wine, crushed black pepper, olives, basil and oregano. Once the tofu has been marinaded it can be roasted and served with a salad of rocket. It is also possible to buy pre-made marinades. Any store-bought marinade can be used with tofu, although it is important to check the ingredients if the tofu is for vegetarians and vegans. The most effective store-bought marinades for use with tofu are highly seasoned marinades. Marinaded tofu is a great way to provide a tasty protein source and is ideal for vegans, vegetarians and meat eaters alike. It is a healthy alternative to other foods making this also a great choice for people who are interested in healthy eating.